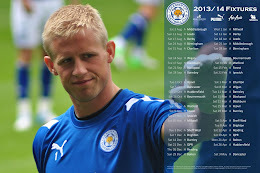 Leicester City goalkeeper Kasper Schmeichel has been awarded a late call-up to the Denmark national squad which travels to Poland and Ukraine for Euro 2012 next month. The 25-year-old will replace injured Thomas Sorensen in Morten Olsen's 23-man touring party and the Danish coach insists he has no fears in handing the uncapped Foxes' keeper a place in his squad. "He has worked seriously on his development as a goalkeeper," said Olsen, "We followed him closely during the season for Leicester."